Breaking down the multiplayer like a Goofy dance number. Disney Infinity is out and hopefully you've read our review. The game is a solid co-op title to play with your kids and the toys are definitely the highlight. The cooperative play not only spans the living room but the internet, a first for a game of its kind. There's a lot going on with Disney Infinity, so let us break it down for you in plain English. How many players can play Disney Infinity locally (couch co-op)? How many players can play Disney Infinity via system link or LAN? How many players can play Disney Infinity online? What direction is the screen split in couch co-op for Disney Infinity? How do you begin a co-op session in Disney Infinity? How does save game progress work for co-op play in Disney Infinity? Can I join a game if the host is further along than me in Disney Infinity? Can I build stuff with objects from a friend's character? What do the codes do that come with the figures? What game modes is online co-op available in for Disney Infinity? Can I use any character in a Playset in Disney Infinity? Is there a limit to the number of power discs I can use in Disney Infinity? 2 players are supported in split-screen play for Disney Infinity. Only online or couch co-op is supported. Up to 4 players can play Disney Infinity in online co-op, including combo co-op with local players. No, you can use a guest account. Vertically for the platforming sections, horizontally for the racing sections. Simply place another character on the portal and press the start button the second controller. For online co-op you have to press start->online->invite friends to invite friends to a session. There's no level limitation in Disney Infinity for playing together. Yes, when a friend is in your game all objects are shared. You may run into limitations later if you don't have access to those objects for editing an existing ToyBox. These are used for the online version of the game for PC which isn't out yet. They will be redeemed for the same character online once the service goes live. You can play the ToyBox and Adventures in online co-op. The Playset Stories are not available in online co-op. No, only characters from that world may be used in a playset. This includes local co-op, you'll need at least two characters from that world to play with a friend. 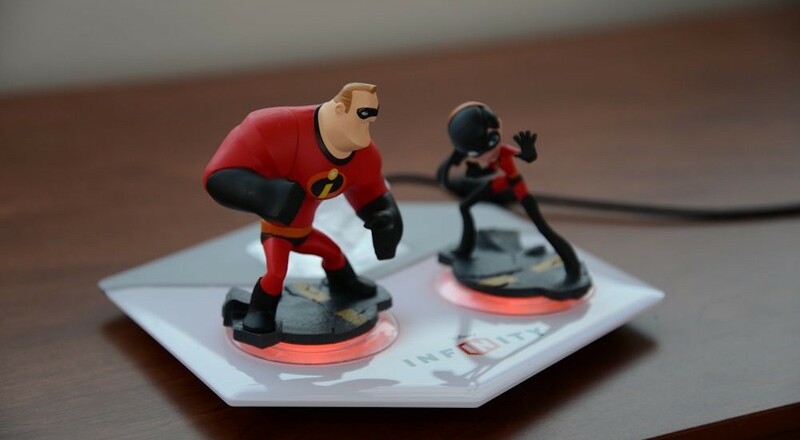 Up to two power discs may be stacked under each character on a portal for Disney Infinity.